Why not ask the experts at Monster Contractor and make sure your bathroom remodel in Fair Oaks has all the modern amenities you need? Our remodel experts can show you beautiful bathroom remodel solutions and create a washroom like a work of art. Monster Contractor bathroom remodels provides Fair Oaks with the most efficient process for performing bathroom renovations. Our full-service approach will create a bathroom you will be proud to show off to your family and friends. Our bathroom remodel approach is far better than that of our competitors because of the uniqueness of our process that is there from the first day to the completion of your bathroom project. You might be concerned about the cost of such attention. Normally, hiring a General Contractor to oversee a bathroom remodel Fair Oaks requires a lot of money. That is not the case with Monster Contractor. We do an in-depth cost analysis before even starting the construction work, to eliminate hidden fees and reduce adjustments to the cost. Layout: Monster Contractor bathroom remodels will design your Fair Oaks bathroom layout, including comfortably fitting your new vanity, bathtub, cabinets and faucets. We will revise and redesign the bathroom layout until you are completely satisfied that it will meet your needs, your budget and your aesthetic style. Bathroom finishes selection: our bathroom remodel expert will help you choose the most complimentary finishes for your Fair Oaks bathroom so that all tile work, paint colors, vanities, tubs, and faucets match beautifully. Don’t worry about compromising the quality of finishes; we only use materials and products from manufacturers you’ve heard of and will find the best price on the look you’re going for. 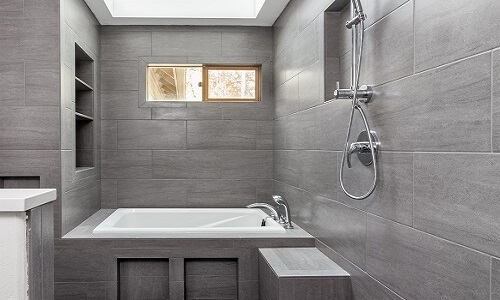 After construction is complete, your new bathroom will be stronger and more welcoming than ever before, making it no surprise why we are the best contractors to go to for bathroom remodels in Fair Oaks CA. All of Monster Contractor’s general contracting employees undergo a comprehensive training process, making our bathroom remodel team the best in Fair Oaks California. We are known in Northern California as the brand name in contractors for creating the best service, problem-solving, quality, project management and warranties offered. Despite any challenges in bathroom remodels for Fair Oaks, when you choose Monster Contractor as your contractor, you’ll benefit from the skills and experience that many other contractors lack. Our Fair Oaks bathroom remodel crew always strives for complete customer satisfaction and will give their all to meet or exceed your expectations. Generally speaking, if the bathroom is functional, it’s fine. However, the average homeowner spends 1.5 years of their life in the bathroom. Given that, it is no surprise so many homeowners in Fair Oaks want to remodel their bathrooms. When it is time to renovate, you can install the cabinets, lighting and faucets you always wanted. Monster Contractor bathroom remodel of Fair Oaks believes your bathroom is more than just a functional room in your home. Through a remodel, your bathroom can transform into the most relaxing and beautiful room in your home. Monster Contractor also takes beauty and usability aspects into consideration. If you’re not sure what feel or look your family would like in your bathroom, that’s no problem. Before starting the construction process, our designers will present you with options for possible designs. We will only start the construction when you agree on a design and blueprint that includes all the requirements. Our staff of insured and licensed Fair Oaks, CA experts knows exactly what building permits, techniques and materials are needed to create the best bathroom this city can offer. You will end up with a bathroom you can confidently show off to your friends. Regardless of the scale of your bathroom renovation needs, you can count on our expert Fair Oaks staff to create the bathroom of your dreams. Monster Contractor is a full-service General Contractor and Construction Company located in Fair Oaks. We provide our industrial, commercial & residential clients with premier service and quality assistance throughout the greater Fair Oaks area. We work hard to provide what seems to have been lacking in recent years: a contractor who wants to provide quality service at a fair price. As a result, many of our clients call us back year after year. Monster Contractor of Fair Oaks is a fully licensed and insured construction company. Whether you need commercial, industrial or residential construction, we'll have our best journeymen on the project. We have over 50 years combined experience in the commercial construction and industrial construction industries. Our Property Maintenance experience, like electrical, plumbing, gutter cleaning, etc. will keep help your Fair Oaks facility running smoothly. Commercial Tenant Improvement in Fair Oaks is easy with us. Apartment building and property owners have trusted us for years to improve the lives of their tenants. From small projects to new builds, we have managed all types of Construction Management projects in and around Fair Oaks, California. Retirement homes, government offices and apartment buildings are just some of the Facility Maintenance services we offer. We work directly with YGRENE and HERO on Green Building Construction and can be your ally on energy-proofing your property in Fair Oaks. We have the best solutions for all aspects of home remodeling and Residential Construction in Fair Oaks. Are you doing a Fair Oaks Home Remodel? Room Addition? Kitchen Remodel? Whether it’s a bathroom remodel or complete or partial remodel, we can simplify your remodeling needs. Call Monsters Concrete for a complete estimate to repair foundations and other concrete products. We even have Home Maintenance and home cleaning solutions and can make ourselves available for the smallest detail. Earthquake Damage Restoration and retrofit as well as Fire Damage Restoration mitigation can be expensive if you’re not familiar with restoration in Fair Oaks. Insurance Restoration and working with insurance companies is difficult. Let our experience simplify the process. Storm Damage Restoration can happen at any time of year. We offer services for each season. Water Damage Restoration from leaks can destroy your home. Fast comprehensive repair from Monsters Roofing is the best solution. Why not ask the experts at Monster Contractor and make sure your bathroom remodel in El Dorado Hills has all the modern amenities you need? Our remodel experts can show you beautiful bathroom remodel solutions and create a washroom like a work of art. Monster Contractor bathroom remodels provides El Dorado Hills with the most efficient process for performing bathroom renovations. Our full-service approach will create a bathroom you will be proud to show off to your family and friends. Our bathroom remodel approach is far better than that of our competitors because of the uniqueness of our process that is there from the first day to the completion of your bathroom project. You might be concerned about the cost of such attention. Normally, hiring a General Contractor to oversee a bathroom remodel El Dorado Hills requires a lot of money. That is not the case with Monster Contractor. We do an in-depth cost analysis before even starting the construction work, to eliminate hidden fees and reduce adjustments to the cost. Layout: Monster Contractor bathroom remodels will design your El Dorado Hills bathroom layout, including comfortably fitting your new vanity, bathtub, cabinets and faucets. We will revise and redesign the bathroom layout until you are completely satisfied that it will meet your needs, your budget and your aesthetic style. Bathroom finishes selection: our bathroom remodel expert will help you choose the most complimentary finishes for your El Dorado Hills bathroom so that all tile work, paint colors, vanities, tubs, and faucets match beautifully. Don’t worry about compromising the quality of finishes; we only use materials and products from manufacturers you’ve heard of and will find the best price on the look you’re going for. After construction is complete, your new bathroom will be stronger and more welcoming than ever before, making it no surprise why we are the best contractors to go to for bathroom remodels in El Dorado Hills CA. All of Monster Contractor’s general contracting employees undergo a comprehensive training process, making our bathroom remodel team the best in El Dorado Hills California. We are known in Northern California as the brand name in contractors for creating the best service, problem-solving, quality, project management and warranties offered. Despite any challenges in bathroom remodels for El Dorado Hills, when you choose Monster Contractor as your contractor, you’ll benefit from the skills and experience that many other contractors lack. Our El Dorado Hills bathroom remodel crew always strives for complete customer satisfaction and will give their all to meet or exceed your expectations. Generally speaking, if the bathroom is functional, it’s fine. However, the average homeowner spends 1.5 years of their life in the bathroom. Given that, it is no surprise so many homeowners in El Dorado Hills want to remodel their bathrooms. When it is time to renovate, you can install the cabinets, lighting and faucets you always wanted. Monster Contractor bathroom remodel of El Dorado Hills believes your bathroom is more than just a functional room in your home. Through a remodel, your bathroom can transform into the most relaxing and beautiful room in your home. Monster Contractor also takes beauty and usability aspects into consideration. If you’re not sure what feel or look your family would like in your bathroom, that’s no problem. Before starting the construction process, our designers will present you with options for possible designs. We will only start the construction when you agree on a design and blueprint that includes all the requirements. Our staff of insured and licensed El Dorado Hills, CA experts knows exactly what building permits, techniques and materials are needed to create the best bathroom this city can offer. You will end up with a bathroom you can confidently show off to your friends. Regardless of the scale of your bathroom renovation needs, you can count on our expert El Dorado Hills staff to create the bathroom of your dreams. Why not ask the experts at Monster Contractor and make sure your bathroom remodel in Carmichael has all the modern amenities you need? Our remodel experts can show you beautiful bathroom remodel solutions and create a washroom like a work of art. Monster Contractor bathroom remodels provides Carmichael with the most efficient process for performing bathroom renovations. Our full-service approach will create a bathroom you will be proud to show off to your family and friends. Our bathroom remodel approach is far better than that of our competitors because of the uniqueness of our process that is there from the first day to the completion of your bathroom project. You might be concerned about the cost of such attention. Normally, hiring a General Contractor to oversee a bathroom remodel Carmichael requires a lot of money. That is not the case with Monster Contractor. We do an in-depth cost analysis before even starting the construction work, to eliminate hidden fees and reduce adjustments to the cost. Layout: Monster Contractor bathroom remodels will design your Carmichael bathroom layout, including comfortably fitting your new vanity, bathtub, cabinets and faucets. We will revise and redesign the bathroom layout until you are completely satisfied that it will meet your needs, your budget and your aesthetic style. Bathroom finishes selection: our bathroom remodel expert will help you choose the most complimentary finishes for your Carmichael bathroom so that all tile work, paint colors, vanities, tubs, and faucets match beautifully. Don’t worry about compromising the quality of finishes; we only use materials and products from manufacturers you’ve heard of and will find the best price on the look you’re going for. After construction is complete, your new bathroom will be stronger and more welcoming than ever before, making it no surprise why we are the best contractors to go to for bathroom remodels in Carmichael CA. All of Monster Contractor’s general contracting employees undergo a comprehensive training process, making our bathroom remodel team the best in Carmichael California. We are known in Northern California as the brand name in contractors for creating the best service, problem-solving, quality, project management and warranties offered. Despite any challenges in bathroom remodels for Carmichael, when you choose Monster Contractor as your contractor, you’ll benefit from the skills and experience that many other contractors lack. Our Carmichael bathroom remodel crew always strives for complete customer satisfaction and will give their all to meet or exceed your expectations. Generally speaking, if the bathroom is functional, it’s fine. However, the average homeowner spends 1.5 years of their life in the bathroom. Given that, it is no surprise so many homeowners in Carmichael want to remodel their bathrooms. When it is time to renovate, you can install the cabinets, lighting and faucets you always wanted. Monster Contractor bathroom remodel of Carmichael believes your bathroom is more than just a functional room in your home. Through a remodel, your bathroom can transform into the most relaxing and beautiful room in your home. Monster Contractor also takes beauty and usability aspects into consideration. If you’re not sure what feel or look your family would like in your bathroom, that’s no problem. Before starting the construction process, our designers will present you with options for possible designs. We will only start the construction when you agree on a design and blueprint that includes all the requirements. Our staff of insured and licensed Carmichael, CA experts knows exactly what building permits, techniques and materials are needed to create the best bathroom this city can offer. You will end up with a bathroom you can confidently show off to your friends. Regardless of the scale of your bathroom renovation needs, you can count on our expert Carmichael staff to create the bathroom of your dreams. Why not ask the experts at Monster Contractor and make sure your bathroom remodel in North Highlands has all the modern amenities you need? Our remodel experts can show you beautiful bathroom remodel solutions and create a washroom like a work of art. Monster Contractor bathroom remodels provides North Highlands with the most efficient process for performing bathroom renovations. Our full-service approach will create a bathroom you will be proud to show off to your family and friends. Our bathroom remodel approach is far better than that of our competitors because of the uniqueness of our process that is there from the first day to the completion of your bathroom project. You might be concerned about the cost of such attention. Normally, hiring a General Contractor to oversee a bathroom remodel North Highlands requires a lot of money. That is not the case with Monster Contractor. We do an in-depth cost analysis before even starting the construction work, to eliminate hidden fees and reduce adjustments to the cost. Layout: Monster Contractor bathroom remodels will design your North Highlands bathroom layout, including comfortably fitting your new vanity, bathtub, cabinets and faucets. We will revise and redesign the bathroom layout until you are completely satisfied that it will meet your needs, your budget and your aesthetic style. Bathroom finishes selection: our bathroom remodel expert will help you choose the most complimentary finishes for your North Highlands bathroom so that all tile work, paint colors, vanities, tubs, and faucets match beautifully. Don’t worry about compromising the quality of finishes; we only use materials and products from manufacturers you’ve heard of and will find the best price on the look you’re going for. 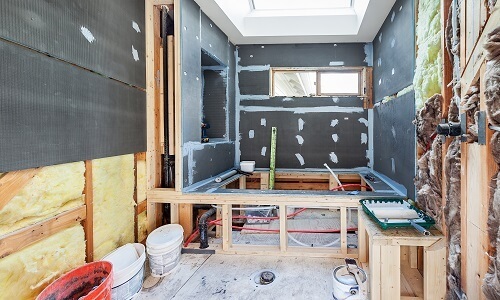 After construction is complete, your new bathroom will be stronger and more welcoming than ever before, making it no surprise why we are the best contractors to go to for bathroom remodels in North Highlands CA. All of Monster Contractor’s general contracting employees undergo a comprehensive training process, making our bathroom remodel team the best in North Highlands California. We are known in Northern California as the brand name in contractors for creating the best service, problem-solving, quality, project management and warranties offered. Despite any challenges in bathroom remodels for North Highlands, when you choose Monster Contractor as your contractor, you’ll benefit from the skills and experience that many other contractors lack. Our North Highlands bathroom remodel crew always strives for complete customer satisfaction and will give their all to meet or exceed your expectations. Generally speaking, if the bathroom is functional, it’s fine. However, the average homeowner spends 1.5 years of their life in the bathroom. Given that, it is no surprise so many homeowners in North Highlands want to remodel their bathrooms. When it is time to renovate, you can install the cabinets, lighting and faucets you always wanted. Monster Contractor bathroom remodel of North Highlands believes your bathroom is more than just a functional room in your home. Through a remodel, your bathroom can transform into the most relaxing and beautiful room in your home. Monster Contractor also takes beauty and usability aspects into consideration. If you’re not sure what feel or look your family would like in your bathroom, that’s no problem. Before starting the construction process, our designers will present you with options for possible designs. We will only start the construction when you agree on a design and blueprint that includes all the requirements. Our staff of insured and licensed North Highlands, CA experts knows exactly what building permits, techniques and materials are needed to create the best bathroom this city can offer. You will end up with a bathroom you can confidently show off to your friends. Regardless of the scale of your bathroom renovation needs, you can count on our expert North Highlands staff to create the bathroom of your dreams. Monster Contractor is a full-service General Contractor and Construction Company located in North Highlands. We provide our industrial, commercial & residential clients with premier service and quality assistance throughout the greater North Highlands area. We work hard to provide what seems to have been lacking in recent years: a contractor who wants to provide quality service at a fair price. As a result, many of our clients call us back year after year. Monster Contractor of North Highlands is a fully licensed and insured construction company. Whether you need commercial, industrial or residential construction, we'll have our best journeymen on the project. We have over 50 years combined experience in the commercial construction and industrial construction industries. Our Property Maintenance experience, like electrical, plumbing, gutter cleaning, etc. will keep help your North Highlands facility running smoothly. Commercial Tenant Improvement in North Highlands is easy with us. Apartment building and property owners have trusted us for years to improve the lives of their tenants. From small projects to new builds, we have managed all types of Construction Management projects in and around North Highlands, California. Retirement homes, government offices and apartment buildings are just some of the Facility Maintenance services we offer. We work directly with YGRENE and HERO on Green Building Construction and can be your ally on energy-proofing your property in North Highlands. We have the best solutions for all aspects of home remodeling and Residential Construction in North Highlands. Are you doing a North Highlands Home Remodel? Room Addition? Kitchen Remodel? Whether it’s a bathroom remodel or complete or partial remodel, we can simplify your remodeling needs. Call Monsters Concrete for a complete estimate to repair foundations and other concrete products. We even have Home Maintenance and home cleaning solutions and can make ourselves available for the smallest detail. Earthquake Damage Restoration and retrofit as well as Fire Damage Restoration mitigation can be expensive if you’re not familiar with restoration in North Highlands. Insurance Restoration and working with insurance companies is difficult. Let our experience simplify the process. Storm Damage Restoration can happen at any time of year. We offer services for each season. Water Damage Restoration from leaks can destroy your home. Fast comprehensive repair from Monsters Roofing is the best solution. Why not ask the experts at Monster Contractor and make sure your bathroom remodel in Loomis has all the modern amenities you need? Our remodel experts can show you beautiful bathroom remodel solutions and create a washroom like a work of art. Monster Contractor bathroom remodels provides Loomis with the most efficient process for performing bathroom renovations. Our full-service approach will create a bathroom you will be proud to show off to your family and friends. Our bathroom remodel approach is far better than that of our competitors because of the uniqueness of our process that is there from the first day to the completion of your bathroom project. You might be concerned about the cost of such attention. Normally, hiring a General Contractor to oversee a bathroom remodel Loomis requires a lot of money. That is not the case with Monster Contractor. We do an in-depth cost analysis before even starting the construction work, to eliminate hidden fees and reduce adjustments to the cost. Layout: Monster Contractor bathroom remodels will design your Loomis bathroom layout, including comfortably fitting your new vanity, bathtub, cabinets and faucets. We will revise and redesign the bathroom layout until you are completely satisfied that it will meet your needs, your budget and your aesthetic style. Bathroom finishes selection: our bathroom remodel expert will help you choose the most complimentary finishes for your Loomis bathroom so that all tile work, paint colors, vanities, tubs, and faucets match beautifully. Don’t worry about compromising the quality of finishes; we only use materials and products from manufacturers you’ve heard of and will find the best price on the look you’re going for. After construction is complete, your new bathroom will be stronger and more welcoming than ever before, making it no surprise why we are the best contractors to go to for bathroom remodels in Loomis CA. All of Monster Contractor’s general contracting employees undergo a comprehensive training process, making our bathroom remodel team the best in Loomis California. We are known in Northern California as the brand name in contractors for creating the best service, problem-solving, quality, project management and warranties offered. Despite any challenges in bathroom remodels for Loomis, when you choose Monster Contractor as your contractor, you’ll benefit from the skills and experience that many other contractors lack. Our Loomis bathroom remodel crew always strives for complete customer satisfaction and will give their all to meet or exceed your expectations. Generally speaking, if the bathroom is functional, it’s fine. However, the average homeowner spends 1.5 years of their life in the bathroom. Given that, it is no surprise so many homeowners in Loomis want to remodel their bathrooms. When it is time to renovate, you can install the cabinets, lighting and faucets you always wanted. Monster Contractor bathroom remodel of Loomis believes your bathroom is more than just a functional room in your home. Through a remodel, your bathroom can transform into the most relaxing and beautiful room in your home. Monster Contractor also takes beauty and usability aspects into consideration. If you’re not sure what feel or look your family would like in your bathroom, that’s no problem. Before starting the construction process, our designers will present you with options for possible designs. We will only start the construction when you agree on a design and blueprint that includes all the requirements. Our staff of insured and licensed Loomis, CA experts knows exactly what building permits, techniques and materials are needed to create the best bathroom this city can offer. You will end up with a bathroom you can confidently show off to your friends. Regardless of the scale of your bathroom renovation needs, you can count on our expert Loomis staff to create the bathroom of your dreams. Why not ask the experts at Monster Contractor and make sure your bathroom remodel in Orangevale has all the modern amenities you need? Our remodel experts can show you beautiful bathroom remodel solutions and create a washroom like a work of art. Monster Contractor bathroom remodels provides Orangevale with the most efficient process for performing bathroom renovations. Our full-service approach will create a bathroom you will be proud to show off to your family and friends. Our bathroom remodel approach is far better than that of our competitors because of the uniqueness of our process that is there from the first day to the completion of your bathroom project. You might be concerned about the cost of such attention. Normally, hiring a General Contractor to oversee a bathroom remodel Orangevale requires a lot of money. That is not the case with Monster Contractor. We do an in-depth cost analysis before even starting the construction work, to eliminate hidden fees and reduce adjustments to the cost. Layout: Monster Contractor bathroom remodels will design your Orangevale bathroom layout, including comfortably fitting your new vanity, bathtub, cabinets and faucets. We will revise and redesign the bathroom layout until you are completely satisfied that it will meet your needs, your budget and your aesthetic style. Bathroom finishes selection: our bathroom remodel expert will help you choose the most complimentary finishes for your Orangevale bathroom so that all tile work, paint colors, vanities, tubs, and faucets match beautifully. Don’t worry about compromising the quality of finishes; we only use materials and products from manufacturers you’ve heard of and will find the best price on the look you’re going for. After construction is complete, your new bathroom will be stronger and more welcoming than ever before, making it no surprise why we are the best contractors to go to for bathroom remodels in Orangevale CA. All of Monster Contractor’s general contracting employees undergo a comprehensive training process, making our bathroom remodel team the best in Orangevale California. We are known in Northern California as the brand name in contractors for creating the best service, problem-solving, quality, project management and warranties offered. Despite any challenges in bathroom remodels for Orangevale, when you choose Monster Contractor as your contractor, you’ll benefit from the skills and experience that many other contractors lack. Our Orangevale bathroom remodel crew always strives for complete customer satisfaction and will give their all to meet or exceed your expectations. Generally speaking, if the bathroom is functional, it’s fine. However, the average homeowner spends 1.5 years of their life in the bathroom. Given that, it is no surprise so many homeowners in Orangevale want to remodel their bathrooms. When it is time to renovate, you can install the cabinets, lighting and faucets you always wanted. Monster Contractor bathroom remodel of Orangevale believes your bathroom is more than just a functional room in your home. Through a remodel, your bathroom can transform into the most relaxing and beautiful room in your home. Monster Contractor also takes beauty and usability aspects into consideration. If you’re not sure what feel or look your family would like in your bathroom, that’s no problem. Before starting the construction process, our designers will present you with options for possible designs. We will only start the construction when you agree on a design and blueprint that includes all the requirements. Our staff of insured and licensed Orangevale, CA experts knows exactly what building permits, techniques and materials are needed to create the best bathroom this city can offer. You will end up with a bathroom you can confidently show off to your friends. Regardless of the scale of your bathroom renovation needs, you can count on our expert Orangevale staff to create the bathroom of your dreams. Why not ask the experts at Monster Contractor and make sure your bathroom remodel in Roseville has all the modern amenities you need? Our remodel experts can show you beautiful bathroom remodel solutions and create a washroom like a work of art. Monster Contractor bathroom remodels provides Roseville with the most efficient process for performing bathroom renovations. Our full-service approach will create a bathroom you will be proud to show off to your family and friends. Our bathroom remodel approach is far better than that of our competitors because of the uniqueness of our process that is there from the first day to the completion of your bathroom project. You might be concerned about the cost of such attention. Normally, hiring a General Contractor to oversee a bathroom remodel Roseville requires a lot of money. That is not the case with Monster Contractor. We do an in-depth cost analysis before even starting the construction work, to eliminate hidden fees and reduce adjustments to the cost. Layout: Monster Contractor bathroom remodels will design your Roseville bathroom layout, including comfortably fitting your new vanity, bathtub, cabinets and faucets. We will revise and redesign the bathroom layout until you are completely satisfied that it will meet your needs, your budget and your aesthetic style. Bathroom finishes selection: our bathroom remodel expert will help you choose the most complimentary finishes for your Roseville bathroom so that all tile work, paint colors, vanities, tubs, and faucets match beautifully. Don’t worry about compromising the quality of finishes; we only use materials and products from manufacturers you’ve heard of and will find the best price on the look you’re going for. After construction is complete, your new bathroom will be stronger and more welcoming than ever before, making it no surprise why we are the best contractors to go to for bathroom remodels in Roseville CA. All of Monster Contractor’s general contracting employees undergo a comprehensive training process, making our bathroom remodel team the best in Roseville California. We are known in Northern California as the brand name in contractors for creating the best service, problem-solving, quality, project management and warranties offered. Despite any challenges in bathroom remodels for Roseville, when you choose Monster Contractor as your contractor, you’ll benefit from the skills and experience that many other contractors lack. Our Roseville bathroom remodel crew always strives for complete customer satisfaction and will give their all to meet or exceed your expectations. Generally speaking, if the bathroom is functional, it’s fine. However, the average homeowner spends 1.5 years of their life in the bathroom. Given that, it is no surprise so many homeowners in Roseville want to remodel their bathrooms. When it is time to renovate, you can install the cabinets, lighting and faucets you always wanted. Monster Contractor bathroom remodel of Roseville believes your bathroom is more than just a functional room in your home. Through a remodel, your bathroom can transform into the most relaxing and beautiful room in your home. Monster Contractor also takes beauty and usability aspects into consideration. If you’re not sure what feel or look your family would like in your bathroom, that’s no problem. Before starting the construction process, our designers will present you with options for possible designs. We will only start the construction when you agree on a design and blueprint that includes all the requirements. Our staff of insured and licensed Roseville, CA experts knows exactly what building permits, techniques and materials are needed to create the best bathroom this city can offer. You will end up with a bathroom you can confidently show off to your friends. Regardless of the scale of your bathroom renovation needs, you can count on our expert Roseville staff to create the bathroom of your dreams. Why not ask the experts at Monster Contractor and make sure your bathroom remodel in Wilton has all the modern amenities you need? Our remodel experts can show you beautiful bathroom remodel solutions and create a washroom like a work of art. Monster Contractor bathroom remodels provides Wilton with the most efficient process for performing bathroom renovations. Our full-service approach will create a bathroom you will be proud to show off to your family and friends. Our bathroom remodel approach is far better than that of our competitors because of the uniqueness of our process that is there from the first day to the completion of your bathroom project. You might be concerned about the cost of such attention. Normally, hiring a General Contractor to oversee a bathroom remodel Wilton requires a lot of money. That is not the case with Monster Contractor. We do an in-depth cost analysis before even starting the construction work, to eliminate hidden fees and reduce adjustments to the cost. Layout: Monster Contractor bathroom remodels will design your Wilton bathroom layout, including comfortably fitting your new vanity, bathtub, cabinets and faucets. We will revise and redesign the bathroom layout until you are completely satisfied that it will meet your needs, your budget and your aesthetic style. Bathroom finishes selection: our bathroom remodel expert will help you choose the most complimentary finishes for your Wilton bathroom so that all tile work, paint colors, vanities, tubs, and faucets match beautifully. Don’t worry about compromising the quality of finishes; we only use materials and products from manufacturers you’ve heard of and will find the best price on the look you’re going for. 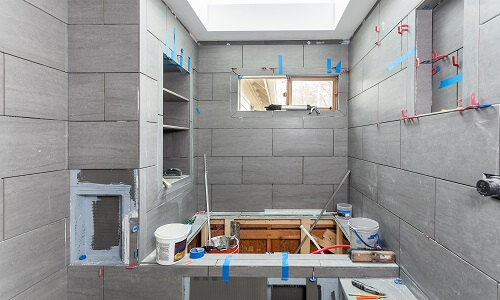 After construction is complete, your new bathroom will be stronger and more welcoming than ever before, making it no surprise why we are the best contractors to go to for bathroom remodels in Wilton CA. All of Monster Contractor’s general contracting employees undergo a comprehensive training process, making our bathroom remodel team the best in Wilton California. We are known in Northern California as the brand name in contractors for creating the best service, problem-solving, quality, project management and warranties offered. Despite any challenges in bathroom remodels for Wilton, when you choose Monster Contractor as your contractor, you’ll benefit from the skills and experience that many other contractors lack. Our Wilton bathroom remodel crew always strives for complete customer satisfaction and will give their all to meet or exceed your expectations. Generally speaking, if the bathroom is functional, it’s fine. However, the average homeowner spends 1.5 years of their life in the bathroom. Given that, it is no surprise so many homeowners in Wilton want to remodel their bathrooms. When it is time to renovate, you can install the cabinets, lighting and faucets you always wanted. Monster Contractor bathroom remodel of Wilton believes your bathroom is more than just a functional room in your home. Through a remodel, your bathroom can transform into the most relaxing and beautiful room in your home. Monster Contractor also takes beauty and usability aspects into consideration. If you’re not sure what feel or look your family would like in your bathroom, that’s no problem. Before starting the construction process, our designers will present you with options for possible designs. We will only start the construction when you agree on a design and blueprint that includes all the requirements. Our staff of insured and licensed Wilton, CA experts knows exactly what building permits, techniques and materials are needed to create the best bathroom this city can offer. You will end up with a bathroom you can confidently show off to your friends. Regardless of the scale of your bathroom renovation needs, you can count on our expert Wilton staff to create the bathroom of your dreams.